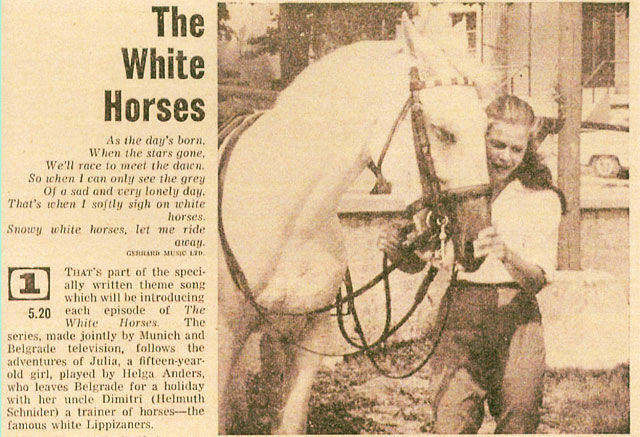 White Horses was written by Michael Carr and Ben Nisbett for the UK import of Yugoslavian/German TV show Ferien in Lipizza, it was credited to "Jacky", who is actually Jackie Lee. The theme song was so successful that it was apparently dubbed back onto non-English versions of the show. Dean & Britta covered the song on their second album, Back Numbers, in 2007. Later that year Sonic Cathedral Records released a seven inch single with a Sonic Boom remix of the track and a "version Française"
The single has sold out but you can get the Sonic Boom remix on Cathedral Classics Vol 1 for a couple of quid - which is quite the bargain! The song has been covered by a hatful of cool folk, most of whom you can find in this post on Everything's Swirling.